The Kiwi connection has served Derbyshire well down the years and the county are hoping it will boost their NatWest T20 Blast chances this summer. John Wright proved to be one of Derbyshire’s greatest overseas signings during his time at the County Ground in the late 1970’s and 1980’s while Martin Guptill played some memorable innings in recent seasons. Now there will be three New Zealanders - and a team within a team - that will open Derbyshire’s T20 campaign against Lancashire at Old Trafford tomorrow afternoon (Saturday). Jimmy Neesham is the second overseas signing for the tournament and lines-up alongside Otago team mates Hamish Rutherford and Neil Broom, who has a British passport. Derbyshire are looking to Neesham to help improve their record in the shortest form of the game while the 25-year-old all-rounder, who bats left-handed and bowls right-arm fast-medium, is looking for a good shift with the county to get back in the international reckoning. Neesham was forced to pull out of New Zealand’s winter’s tour of Australia with a back problem but is ready to bring his T20 pedigree, which includes stints in the Indian and Caribbean Premier Leagues, to the Falcons colours. “It was a good to get on the training pitch this week with the lads for the first time and have a bit of hit and a bowl,” said Neesham who arrived in the country last weekend. 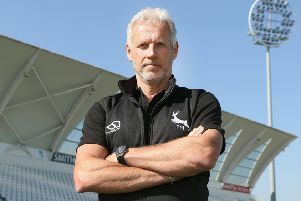 His services were in demand before he opted to join Derbyshire and the presence of Rutherford and Broom plus the reputation of elite performance director Graeme Welch influenced his decision. “I spoke to Neil and Hamish about the lads here and they said it was a great set-up. Graeme being a renowned bowling coach was also definitely one of the factors that made me decide to come here. “It looks like I’ll be bowling in the middle and at the death and batting in the top six so it’s a pretty significant workload but one I’m used to in short-form cricket. Derbyshire got into some good positions in last year’s T20 tournament without getting over the line but the presence of Neesham and his Blackcap colleagues could make a difference over the next two months.